Home / Blog / Are Sheepskins Sustainable? Does anyone need to use sheepskin, are sheepskins sustainable? Fake fur presents an apparent solution to the ethical issues with real fur. I cannot and will not defend the fur industry. But we are at a place in history where the reality of our situation must be acknowledged. We eat meat in the UK. This means we kill a lot of sheep, 15.5 million a year (PDF). Sadly, we destroy nearly all of the sheepskins – a madness only properly appreciated when considering the damage caused by the man made microfibers we create to replace them. Our textile industries have responded to the public demand to ditch fur. A demand to end fur farms and needless slaughter. The trouble is we still wanted ‘fur’. People cleverer than this writer have created faux fur, which approximates that of animal origin but is made instead from plastic, derived from oil. Some of it is pretty good and feels authentic. Most doesn’t come close. All of it is damaging to life on earth. Setting aside the serious global issues that we face because of oil, let’s look at the garment from the moment we first wear it. As soon as you first put them on, your clothes start shedding fibers. This rate increases massively during each wash, Friends of the Earth claim that a single wash load can release up to seventeen million micro fibers. Micro fibers have entered the ecosystem, they’re in our food, in our water, and they are even in us. Washing machines and wastewater treatment plants aren’t designed to trap the minute plastic fibres that our clothes shed during washing. Many of these fibres sneak into our waterways and ultimately the oceans. And lots are caught up in sludge at the treatment plants – which is then sprayed over our soils as fertiliser. Modern fake fur really came into being in the 50’s with the introduction of acrylic polymer fibers. These made man fabrics are easy to work with and can come close to feeling like fur. However, like all plastic, they have a useful lifespan. They also have a much longer decidedly not useful lifespan. Broken faux fur fibers join trillions of tiny pieces of plastic waste that are literally entering the food chain. Man made garments take nearly a thousand years to degrade in landfill, or release damaging gasses when burned. Natural sheepskin simply biodegrades, happily we have on hand millions of sheepskins each year. Sadly, we don’t use them. 99.5% of sheepskin is destroyed as a waste product of the meat industry. We then manufacture fake fur to replace what we have wasted. 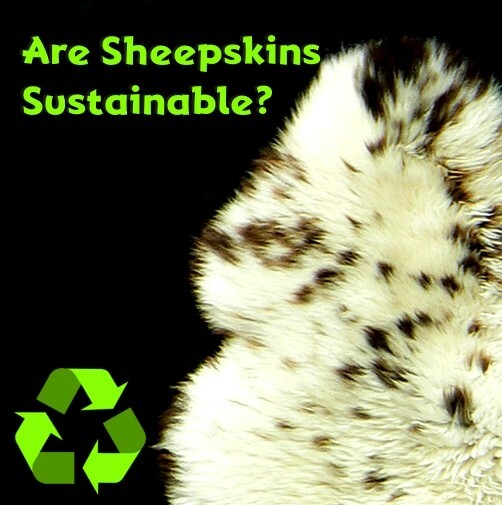 Just 0.45% of sheepskins go through the tanning process, the rest are regarded as hazardous waste. If the public were to look at the issue of waste they might well grow more affectionate towards sheepskin. It is, in my opinion, better than faux fur (it stops ice from melting and refreezing, essential on Dartmoor at sub zero temperatures, and it lets skin breathe). The shear waste is bad enough to make you wince, but to then manufacture a fake replacement for what you have wasted it is just plain wrong. We are going to have to make different choices if we are going to make this life-on-earth thing work out. We are told our dietary choices need looking at too, with a reduction in meat. That is fine by me. But right now as at this moment we are manufacturing a plastic product to replace the natural one we are wasting in ridiculous quantities. Happily, the natural one is also better. Next post: Sheepskins for prams, are sheepskins cool on hot days?